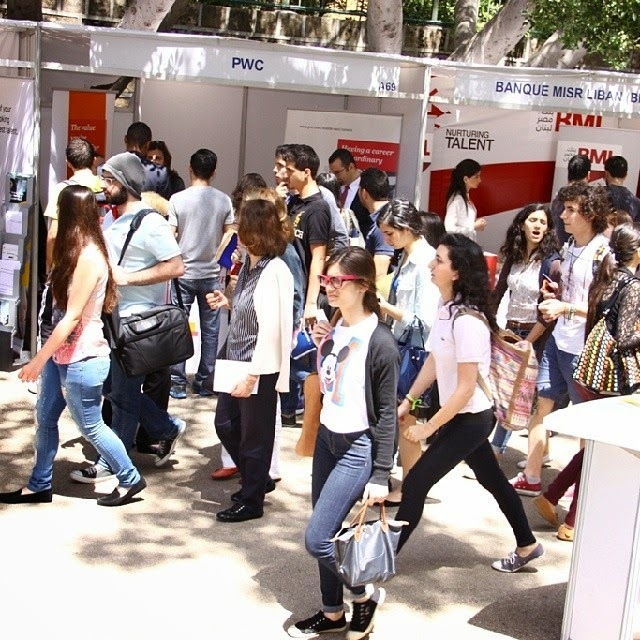 Have you wondered why very few people find jobs at the AUB job fair? AUB charges each company a minimum of $2,000 to be present at the job fair. Obviously, big companies and agencies can afford this and that is why most of them are there. But most of these companies and agencies are not there to hire, very few of them even have fresh graduate positions. These companies are there for three reasons: prestige and brand awareness, a change of scenery for their HR staff and to get the student's emails and phone numbers for spamming purposes. Many start-ups and small companies that are actually recruiting may not be able to afford (or do not have the budget) to participate in the job fair. Thus, AUB students will not be exposed to these new or small companies and struggle more before or after graduation to find jobs in Lebanon. In comparison to other universities in Hamra, LAU charges $300 per campus and Haigazian promotes the companies for free in order to facilitate job search for their students. Once again, AUB proves that financial gain is more important than its students' interest, as if the increasing tuition fees and millions of dollars in donations are not enough. 1) If they charge $2,000 then that company who paid that much money is actively looking for someone to hire, however the market has become more competitive. 2) The recommended qualifications includes years of experience (as in internships) and having a Masters vs before AUB never had a masters program. 3) From the simple picture I just saw, students are not presenting themselves professionally enough to those companies. If it is true that this is a big shot company, then they don't give a damn about your resume and about your courses, the only thing they care about is what and how you can help them improve their company vs any other potential candidate. STUDENTS SHOULD RESEARCH THE COMPANY BEFORE GOING TO THE CAREER FAIR! PRESENT THEMSELVES PROFESSIONALLY! I cannot stress more on this! Wear dress pants, a shirt and a blazer or a tie ! Go there and sell yourself ! Presentation and how you open up to them is the key feature here ! Stop being lazy and expect companies to come to you ! Work hard and you'll get it ! Again, dress professionally (you are selling yourself to the company if you're at your best is a t-shirt with some weird s**** on it and a pair of jeans, then when they hire you they expect you to come with no clothes on if that is the case! Professional clothes, and research the company. Sorry for all the hard feelings for people out there, but no these companies are looking for fresh graduates, not only did i get job offers many occasions but also I've seen people being interviewed on the spot there and I once had a job offer BEFORE GRADUATING IN A YEAR ! So don't tell me that they are not looking for people else they wouldn't lose $2,000 because they don't care they are big companies. Think about it for a minute and blame yourself before blaming anyone, after all that's your first step to success. 1) Most of the stands that I passed by today did not have any open positions, and several actually said that they prefer internal hiring (promotions) rather than hiring from outside. 2) So you are saying that there are no more fresh-graduate jobs any more? 3) Honestly, I see them over-dressed for the quality of HR representatives that are there. Some are even in shorts as if they are on vacations. Anyway, many jobs don't require a formal attire (such as marketing jobs for example), and besides, even if you are dressed up, they won't talk to you more than a minute so it is not worth it. $2,000 for big companies is equal to a business lunch or half a business trip. It doesn't mean a lot to them. Unilever, for example, had a space of 3 stands, but every time someone approaches them for an internship or job opportunities, they would tell them that they are not hiring. They were merely there to expose their brands to the students. Similarly iStyle was there to promote a 5% discount on Macs and iPads. I don't need to blame myself. Due to my perseverance and hard work, I have started working in my field two years before I graduated. Other students are not as lucky. All I'm saying is that AUB should be more caring about their students and do their best to find them jobs (and not financial gain). You would think the best institution in the Middle East (or second best now) would help it's students land on their feet (especially due to increasingly high tuition), but all they care about is making money. The real reason is timing buddy. most firms hire throughout the 4th quarter. that's why top banks and consulting firms never set foot in the job fair. Those that do tell you that they've already hired their analysts and that they're just there for marketing purposes. That's not true. All major banks (Audi, Bankmed, BLOM, Bank of Beirut, Fransabank, Phenicia Bank, Byblos etc...) and consulting firms (KMPG, Deloite, EY, etc...) were at the job fair. They were not recruiting, but they were there. Either case, then it is AUB's fault to fix the timing of the fair then, not the companies, don't you think? Thanks for covering this Mohammad! 4- if you prefer hagazian or lau job fairs, then you are in the wrong university. finally, if someone is not finding a job, my recommendation is check your CV and academic performance. 1. I know for a fact that the minimum charge is $2,000. We approached Dr. Ghandour to recruit for a start-up and that's what they asked for. They didn't even agree to any other barter deal. All numbers mentioned in the article are from asking the respective universities, I am not making these things up. As for financial aid, AUB has enough sources and donations for that. You cannot risk student's futures in the expense of other students getting financial aid. It doesn't make sense at all. P.S. A huge sum of the money made goes to an extravagant gala dinner (with performers) that Dr. Ghandour hosts every year. 2. I passed by almost every stand today and most of the responses I got where: "we currently do not have any open positions, but you can upload your CV on our website for the future." 3. I am not saying people don't get hired through career fairs, I'm saying they don't get hired through AUB's fair. 4. Believe it or not, other universities care more about their students landing jobs right after they graduate, even if it is in small companies and start-ups. A big chunk of AUB students are not even aware of the diverse job opportunities (except for big companies). It is the university's (and specifically the career center's) job to guide them, and not spam them with useless job opportunities which they are so under-qualified for. Finally, I've been working for almost 4 years. AUB has not contributed ANYTHING to my career path. All my clients and jobs are the result of my own perseverance. You would think the best institution in the Middle East (or second best now) would help it's students land on their feet (especially due to increasingly high tuition), but all they care about is making money. Right on point, up till now, all the companies my friends and I worked for were mainly due to our personal efforts of applying everywhere. I never got a job from the AUB fair. Besides if if you go to the AUB fair, the companies will tell you to apply online.